Coltrane Moatshe is a die-hard Chiefs fan. Johannesburg - Just call him Colly – a super substitute who will never get to the field. 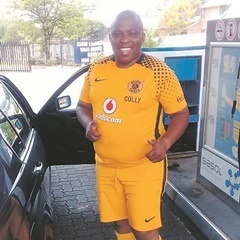 The 42-year-old supporter is becoming ever more popular among Kaizer Chiefs followers thanks to his warm-up antics ahead of matches. Coltrane Moatshe was trending on social media a few days ago after a video clip of him warming up with Chiefs players went viral. The video was taken last season when Chiefs visited Highlands Park FC at Makhulong Stadium in Tembisa, but it only surfaced recently. However, the modest police sergeant from Ramokokastad outside Rustenburg, North West, keeps his feet firmly on the ground. Colly is a die-hard Chiefs supporter and refers to Amakhosi as his family. “Without Chiefs, I’m nothing. But also without us supporters, the club is nothing,” he says. He says he didn’t think anyone would take notice of his antics. It started as a joke, but after supporters cheered him and asked for more, he hasn’t looked back. “The whole thing started one day after a player got injured. I stood up and started warming up. Supporters liked it and started chanting: ‘Colly, Colly, Colly!’ I haven’t looked back since and it has become my trademark". The father of three regards himself as an entertainer and wants people to enjoy matches. Because of his day job as a police officer at Linden Police Station in Johannesburg, he has to balance his passions. “I plan well in advance which games I must attend. Unfortunately, I can’t attend all Chiefs games. My work comes first, even if it means missing some games". Moatshe confesses that he spends lots of money on Chiefs merchandise, but he does not mind. “I spend a lot of money because of the love of the game. I always make sure I have all the replica jerseys because I want to look exactly like [the players] on match days. I’m a super sub, after all,” he says. Fortunately, his wife and kids understand his spending habits. “It’s me first and when I have more to spend, I buy for them too. We are a Chiefs family". Moatshe’s love for Amakhosi started way back in the late 1980s, when he had a poster on his wall featuring the likes of Jan “Malombo” Lechaba, Peta Bala’c, Johannes “Ryder” Mofokeng and Patrick “Ace” Ntsoelengoe. “My uncle found me looking at the picture and told me that it would be my team. I fell in love with the team immediately". The first Chiefs game he attended was at Odi Stadium against Mamelodi Sundowns. He says the experience made him want to watch all of the club’s future games. He says he wants to be remembered as a “loyal supporter, win or lose, because Chiefs is my life”.